My son’s cap had a camouflage-thing going on–made him easy to pick out from the top of the gym’s bleachers, lol. The cap pictured is his girlfriend’s–she came up with her own design. 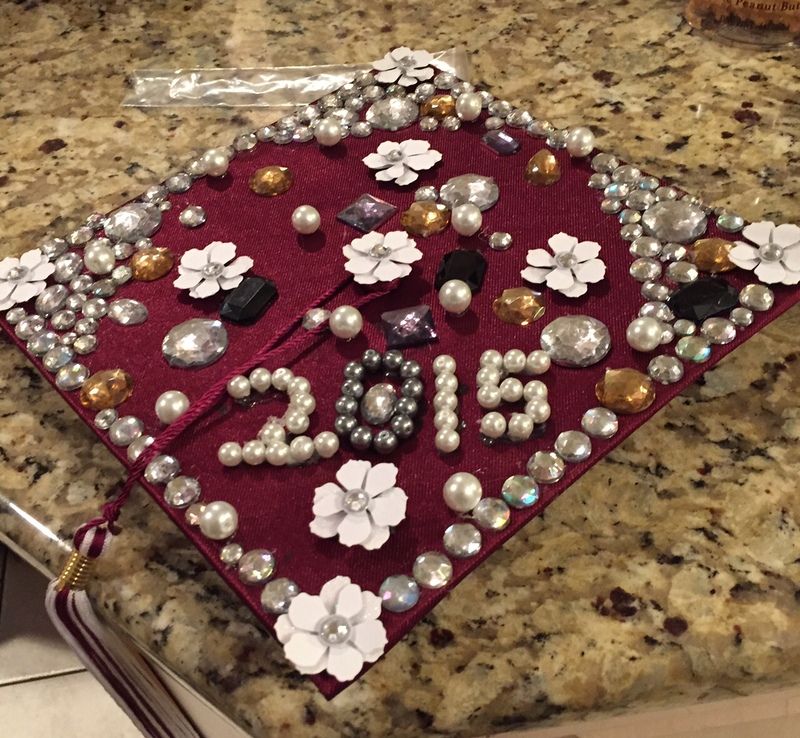 She spent almost as much for those beads as she did for her cap and gown. Ah…youth…. React vs respond–yes, that’s exactly it. And I like what you said about resentment. I think public humiliation will almost always result in that. Kids–like adults–can have long memories. Why torment them with one that will make them feel bad for years? Thanks, Carrie. Unfortunately, those folks who will shame in public might not care or consider the consequence. Or, that person is “in the moment,” and the limbic system took over. I’ve done the same, on many an occasion, I’m sure. When my kids were smaller, I’d give myself the same consequence they’d get for a similar offense. That was often some type of writing, i.e., why what I did was wrong, how I would handle it differently in the future, etc. I believe apologizing to kids is VERY important. Shows them parents are not perfect, and that it’s okay to admit one’s error. Heck, even as an adult I would be hurt by public humiliation. Multiply that by 10 for a child. I feel the same way, Tess. I do much better with my kids now, and definitely far better than with the students I had before becoming a parent (esp. once Younger Son came along and humbled me completely). Even though, there are occasional hiccups–one which I had last night, lol. Thanks! Talk about a recipe for stress. Great point, Tess. Thank you! Great advice, and definitely true for adults too! I think a lot of times as adults people assume we can be tough be above belittling, but I definitely have had some past trauma from belittling exes. The world tells us to “let it roll off,” but that is far easier said than done. Practicing positive thoughts and affirmations helps. It does, however, take conscious effort to counteract the negativity that old stuff seems to automatically bring up. All the best and many thanks for your comment!